Every communication technology has unique nuances that can hinder or improve the effectiveness of the manager. One of the greatest challenges for today’s managers is how to manage effectively the myriad of communication channels that are available. The major criterion used in channel selection is personal convenience–as a channel’s ease of use increases, so does the likelihood of its use. Generally, little consideration is given to how the channels filter the message as well as the secondary messages the channel generates. The chapter presents the B – C model, which helps orient the user’s thinking around the benefits and costs of channel choices. Costs to consider include learning costs in using a technology, as well as some less obvious costs such as opportunity costs, coordination costs, and switching costs. The emphasis is on making channel choices that maximize value. The B – C model suggests some strategies and tactics that enhance the selection and usage of communication technology. 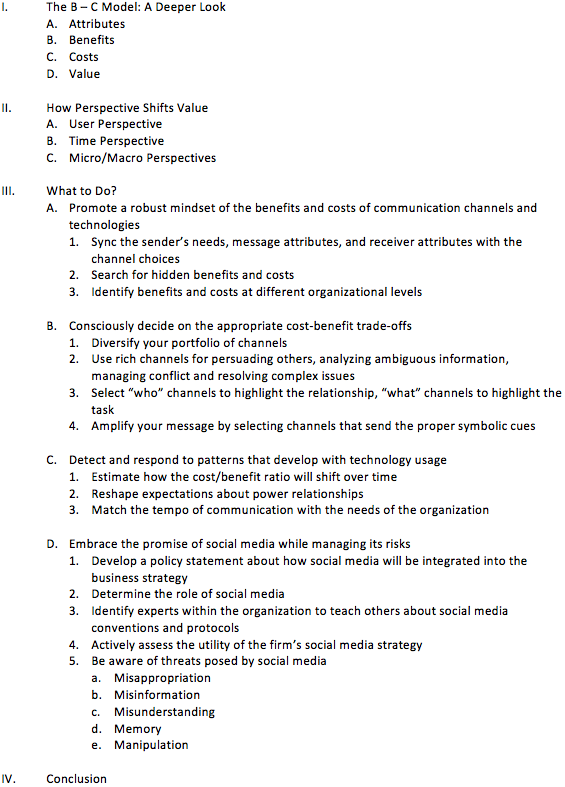 For example, a prudent manager can better manage this complexity by 1) promoting a robust mind-set of the benefits and costs of communication channels, 2) deciding on the appropriate cost-benefit trade-offs when selecting channels (i.e., using rich channels for persuading others and for managing conflict) and 3) embracing the promise of social media while managing the costs of misappropriation, misinformation, misunderstanding, memory and manipulation. The purpose of this case is to determine how to select and effectively use different communication channels. Employees do not feel adequately informed about the direction of the company. Employees are not adequately informed about day-to-day changes. There are shift-to-shift and department-to-department communication problems. The company lives its values of customer-focused quality, safety and empowered employees. The CEO has an MBA from Harvard and an undergraduate degree from MIT. He is an engineer by training, has excellent interpersonal communication skills and is committed to “Managing by Walking Around.” He is well liked by the employees but, in a plant this large, he admits, “it’s difficult to keep in touch with everyone.” In his library-like office, he talked about his vision of having a “world-class communication system.” How should he spend his limited resources in accomplishing this vision? Determine if the mill needs any new channels. Design the proper channel mix for the various communicative functions. Describe how these channels should be utilized. Consider such elements as the content, frequency of their usage, and the audience. Describe how the information should be presented to the CEO. Provide your rationale for the above objectives. What features of the Diffusion of Innovations theory does this clip do a good job of illustrating? What features of the Diffusion of Innovations theory does this clip do a poor or misleading job of illustrating? If you were to add one more slide or idea to the clip, what would it be? Why? What benefits and costs is the clip highlighting? How effective is the clip for the intended audience? If you were to add one more idea or scene to the clip, what would it be? Why? Describe two situations in which a manager selected the a) proper channel(s) to communicate an important message and b) improper channel(s) to communicate an important message. How does the SMCR help explain both situations? Describe three unintended consequences of introducing a new communication technology into an organization. Construct a chart with two columns. In column one, indicate three major reasons why a manager’s channel portfolio would be composed almost entirely of lean channels. In column two, provide counterarguments to each reason. Construct a similar two column chart focused on a managerial portfolio composed almost entirely of rich channels. What key principles in the chapter do these video clips expose? How does the SMCR model help you evaluate the effectiveness of each clip? What rules of thumb (ROTs) regarding channel selection do these clips suggest (e.g., avoid using face-to-face communication when …. )?